Significant Other and I are Worm School Graduates. Yay, we went to worm class this morning and we came home with our new beautiful worm friends! 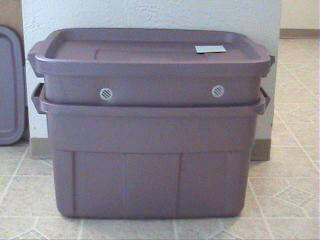 In a very attractive Purple worm bin, no less! Happiness! The talking part of the class lasted about an hour and a half. They told us everything we needed to know. And then we went and set up our worm house. The bin is two, 14gal Rubbermaids. The top one is where the worms live. It has four vents along the top, and a bunch of holes in the bottom. 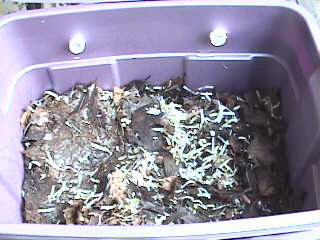 The top Rubbermaid sits inside the bottom one, on top of two wood blocks. The bottom Rubbermaid catches the water that leaks out and there's a drain spout at the bottom of that one. Then they put some bedding in our bin. Some leaf litter and some newspaper shreds. It's less than half full, but that's good since I'll be cleaning Tegan the guinea pig's house and then we'll have plenty of shreds to throw in there. And then our worms! They didn't look very happy when they came out of their ziplock bag... they were probably suffocating in there! But hopefully they will get happy in their new house. We brought them home and SO ate a banana so he could feed them the peel right away! laughs. And I've got a bunch of stuff I've been saving... some dented cans of chickpeas, dead leaves off my house plants, some leftover flax flour which has been sitting way too long. The worms are only supposed to eat vegan food, except they kept talking about adding egg shells. This is to keep the bedding from getting too acidic and also provides grit for the worms gizzard. Now, I haven't rescued any hens or turkey girls lately, so this is going to be a problem. Fortunately, Worms Eat My Garbage says I can use calcium carbonate / powdered limestone instead. I just need to figure out how I can get some of that. hm. Or maybe I could crush up some shells that I got from the coast when we went last year. I would hate to buy oyster shells, since they kill the poor critters and that's definitely not cool. But the shell fragments I picked up... um, were not being used by anybody. :) I'll have to use a hammer on them, the fragments are pretty thick. maybe in a Tyvek envelope. hm. Significant Other is going to be adding food pretty much every day. I put a post-it note on the lid, above the area where he's buring the food. And then I'll move it to the next spot for the next week. That way, we can both be on the same page and nobody gets confused! I am so happy about our worm friends. Landfills make me feel yucky, especially knowing that a huge percentage of the stuff we throw away is organic matter. Our worms are going to help save the world!